Submitted by Jeff Buster on Wed, 10/17/2007 - 13:03. There's a new sidewalk sign in Public Square (and elsewhere downtown). Another sign that our society is dismantling itself into them and us. Isn’t the sign attempting to treat the symptom, not the problem? Isn’t the problem our economic disparity and the economic diseases that preclude practical job prospects for so many in the inner city? The signs in Tower City jettisoning youth are yet another ominous indication we don’t have it all – together. 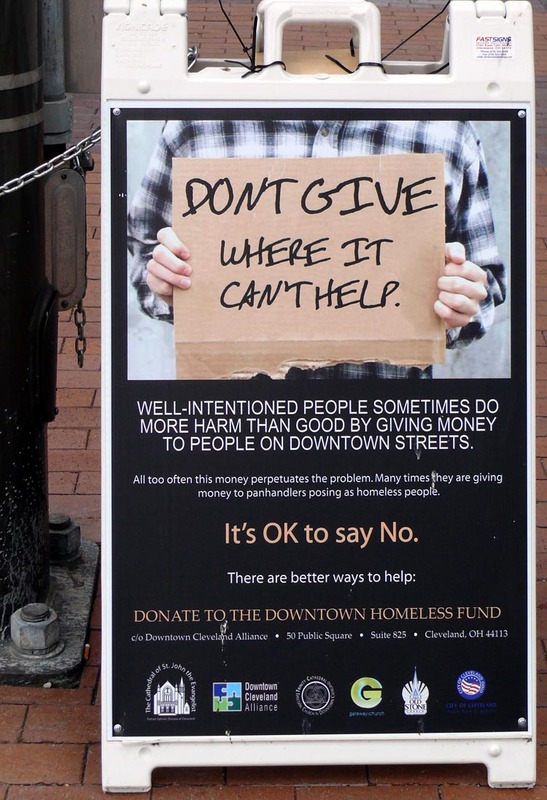 And the faceless gumptionless white guy holding the cardboard sign is a fraud - he represents the downtown business interests who don't give a damn about beggars - they just want the beggars off of the streets in front of their properties. So this sign is a hypocritical fraud. While feigning concern for the panhandlers, the truth is that the Alliance cares only for their own bottom line. Submitted by Susan Miller on Sun, 02/17/2008 - 23:15. Submitted by Susan Miller on Mon, 12/22/2008 - 21:01. “When the economic tide goes out..."
Submitted by Norm Roulet on Mon, 12/22/2008 - 21:44. Cleveland should sue Wolstein for destroying all the historic property in the Flats, that he blighted. I hope he loses his land down there, so we can get it into the county landbank and develop it as an urban farm... that's my proposal for the East Bank, post Wolstein. And take his name off everything. Submitted by jerleen1 on Mon, 12/22/2008 - 21:47. When I see a young person on the street - I think of my son - and hope that if he were ever out there and, maybe just need change for the bus or a cup of coffee, no I pray that someone would be kind enough to, without hatred in their heart and soul, spare him what they could. It might make the difference in whether or not he would get home or could go in and sit down in a warm place and have something to drink - he might not even be homeless or whatever, sometimes people just need a little compassion. If you can't give freely and with a warm heart - then keep it in your pocket - because there is one thing about it - moving the homeless out of your sight won't ease your conscious and it won't make the fact that they sleep under bridges, out in the cold in card board boxes and eat whenever and whatever they can go away. I just don't understand why people are so greedy and stingy these days. It seems like the more some people have or the richer some people are the stinger they are. I will never understand why people go to such lengths to fight against those less fortunate. You know it is but by the grace of God that all of us are not in those circmstances.